Alexander Noel Constantine was born at Moama, New South Wales on 13th December 1914. He joined the RAF on a short service commission in May 1938 and in June 1940 he was serving with 141 Squadron at Turnhouse. He served with 141 throughout the Battle of Britain and beyond until 28th April 1941 when he went to 23 Squadron at Ford, operating Havocs on night intruder sorties. On 4th June 1941 he took up instructing duties at 60 OTU East Fortune, this was followed by a return to Defiants with 264 Squadron at West Malling on 6th October 1941 followed by a month at Fairwood Common with 125 Squadron. A posting to 87 Squadron at Colerne on Hurricanes also lasted a month before he was detailed to prepare for service in India, setting sail in March 1942. He commanded 273 Squadron in Ceylon from April 1942 until June 1943 in defence of the ports there. Constantine then took command of 136 Squadron at Baigachi. On 15th January he destroyed a Mitsubishi A6M-3 Zero and damaged another, on the 20th destroyed a Nakajima Ki 43, on 15th February another Zero and in March a Nakajima Ki 44. In April 1944 Constantine was promoted to Wing Commander and posted to a staff job. 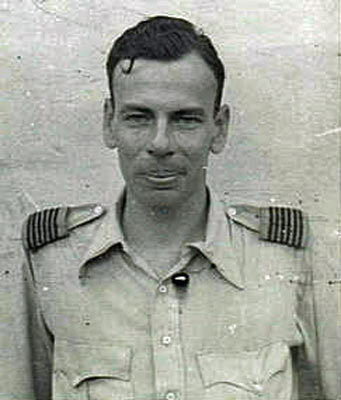 Released from the RAF in December 1946, he returned to Australia and began flying in the former Dutch East Indies area. Following the unconditional surrender of Imperial Japanese forces throughout Asia in 1945, nationalists declared the establishment of the Republic of Indonesia over the territory of the Dutch East Indies on 17th August. The previous colonial power, the Netherlands, though weakened by its own occupation, decided to mount a police action to regain control of its colony. The newly-formed independent Indonesian Air Force, ‘Angkatan Udara Republik Indonesia’ (AURI), had commandeered aircraft and airfields abandoned by the Japanese. To neutralise this threat the Dutch forces launched "Operation Pelikaan" on 21st July 1947, this involved coordinated attacks on AURI airfields which destroyed many of the aircraft they had accumulated. 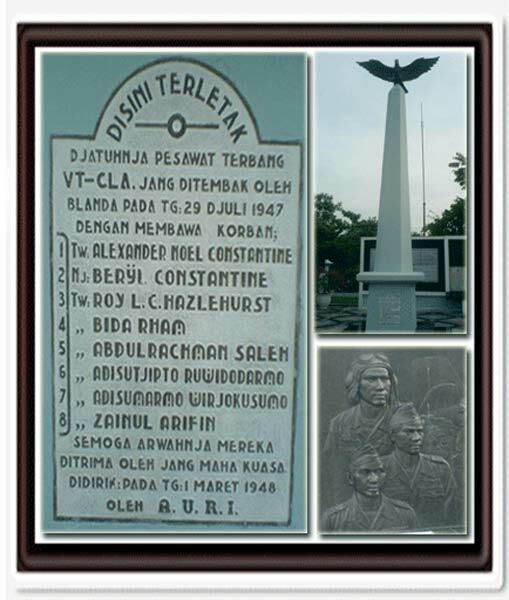 In the early hours of 29th July three AURI pilots, Captain Muljono, flying a Mitsubishi KI-51 fighter (Allied code name ‘Sonia’), Sutarjo Sigit and Suharnoko Harbani, both flying Yokosuka K5Y1 training biplanes (Allied code name ‘Willow’) launched a counter-attack from Maguwo near Yogyakarta, bombing Dutch army positions in Semarang, Ambarawa and Salatiga. In the absence of bomb bays the pilots lobbed small bombs by hand, very little damage and no casualties were inflicted. The aircraft returned to base at treetop height and after landing the ground crew hid the planes under the trees. About two hours later two Dutch P-40 Kittyhawks strafed Yogyakarta. That afternoon a Kittyhawk shot down an Indian transport plane, a C-47 Dakota, which was on approach to Maguwo (having left from Singapore) carrying medicines donated by the Malayan Red Cross. 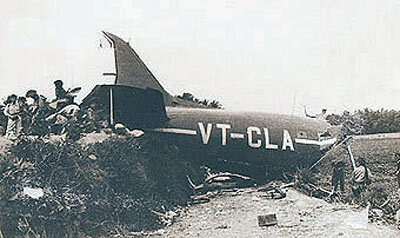 The Dakota came down in a nearby village, killing all three AURI crew members: A. Adisutjipto, A. Saleh and P. Adisumarno. 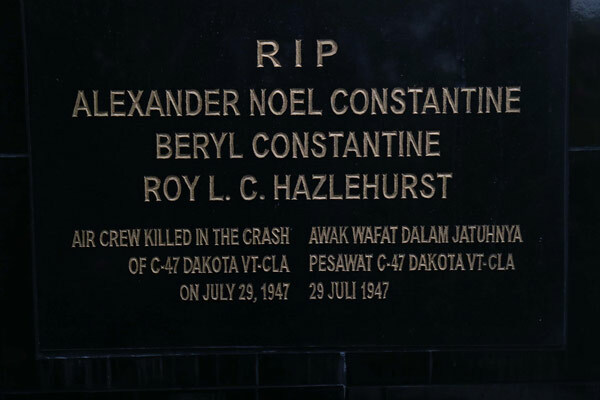 Also killed were pilot Alexander Noel Constantine (Australian), co-pilot Roy Hazlehurst (British), flight engineer Bidha Ram (Indian), Zainal Arifin (the Indonesian consul in Malaya) and Mrs. Constantine. The only survivor was passenger A. Handokotjokro. 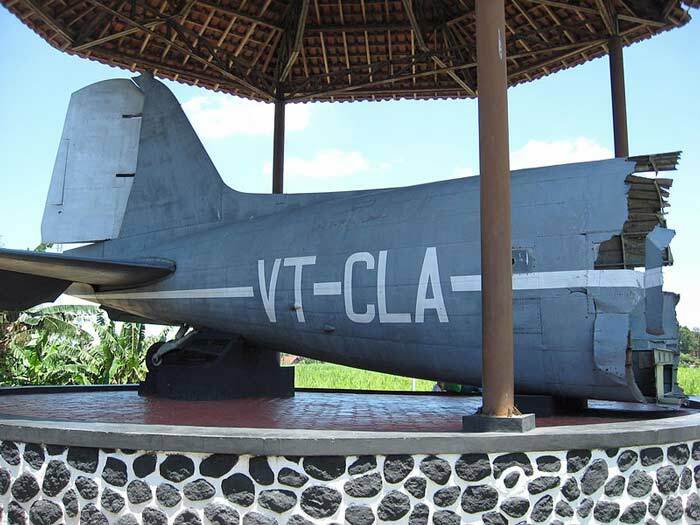 The Dakota had been operated by the government of the Indian state of Orissa as VT-CLA but was purchased by supporters of the new Indonesian republic. The Indonesians claimed that the aircraft had carried Red Cross markings but the Dutch said that the Dutch authorities had not been informed of the flight and that the aircraft carried no Red Cross markings. They also claimed that the Kittyhawk was under orders to force the Dakota to land on the nearest airfield in Dutch control and that after warning shots were fired the Dakota hit a tree and crashed. The Dutch subsequently claimed that they suspected that the aircraft was carrying arms, but this has never been established. It is quite possible that arms may have been loaded without the knowledge of the crew. 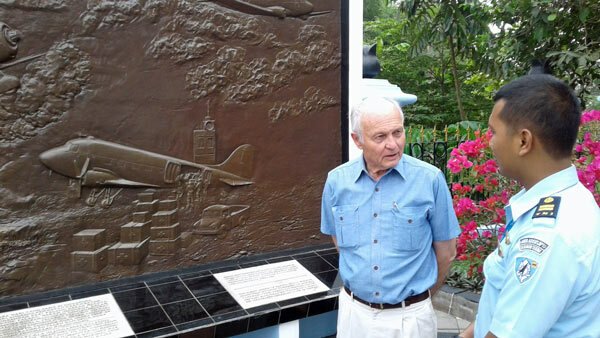 The 29th July was then marked as ‘Indonesian Air Force Dedication Day’ and the three Indonesian casualties of VT-CLA, A. Adisutjipto, A. Saleh and P. Adisumarno have had airports named after them in Yogyakarta, Malang and Surakarta. 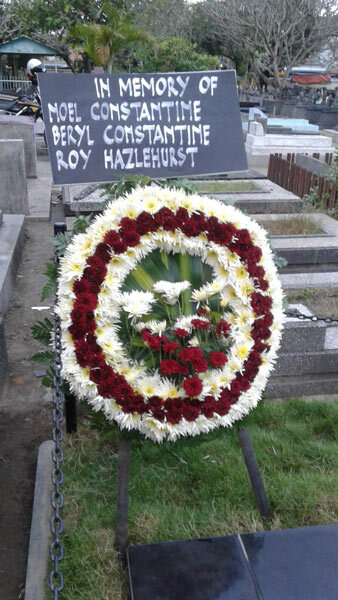 The Constantines and Hazlehurst were buried in a cemetery at Yogyakarta. 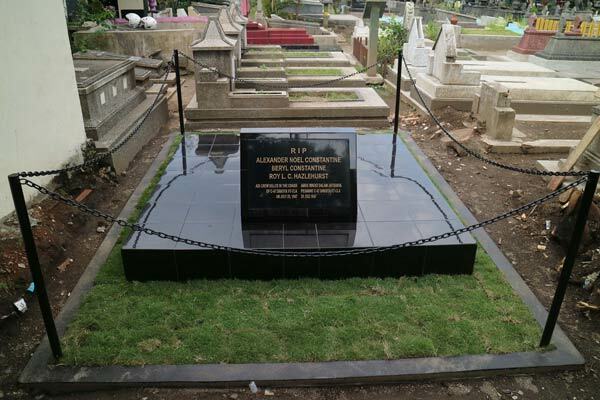 In 2016 the Australia Indonesia Association of New South Wales and the Constantine family combined to place a memorial stone on the previously unmarked grave (below). 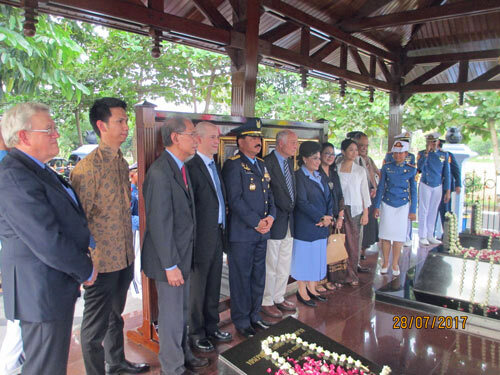 On 28th/29th July 2017, the latter the 70th anniversary of the incident, various commemorations were held at the crash memorial and the grave site. 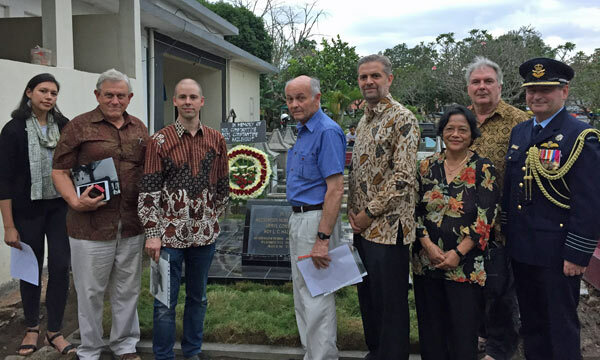 Images courtesy of Michael Kramer, History Subcommittee of the Australia-Indonesia Association of NSW. 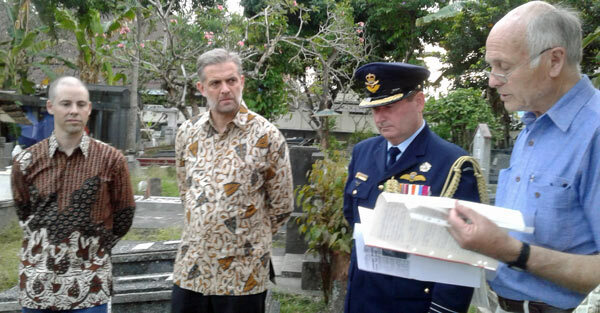 Above L to R: Andrew Constantine (great nephew), Dr. Steven Barraclough (Minister Counsellor, representing Australian ambassador), Group Captain Steve Cook RAAF (Air Attache, Australian Embassy), Geoff Constantine (nephew). Above: Geoff Constantine (nephew) at the memorial.